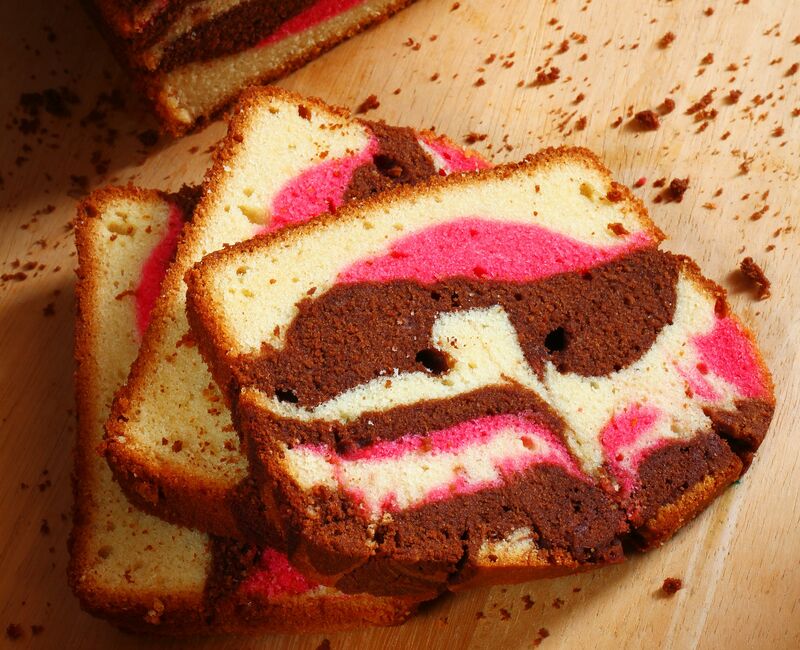 Make this pretty Moist Marble Cake, the perfect addition to your range of Hari Raya kuih. This recipe was first published in Flavours magazine. Preheat oven to 170 degrees Celcius. Line a large loaf pan with parchment paper. Sift flour with baking powder and salt. Beat margarine and sugar until light and creamy. Add eggs one at a time, beating until combined. Mix in the vanilla essence. Fold in the flour in three batches with the milk; start and end with flour. Divide the batter into 3, one batch to fold into the chocolate, another batch to mix in with a few drops of food colour and leaving the last batch plain. In a cake pan, spoon in alternating batter colours. Use a wooden skewer to swirl the mixture to create a marbling effect. Bake in the oven, rotating pan midway at 20 minutes, for 40 to 45 minutes, until cake tester comes out clean. Remove from oven and cool before serving.